MIT’s Journal, Innovations: Technology, Governance, Globalization just released a special edition focused on Haiti which includes lead articles by President Bill Clinton and Digicel’s CEO Denis O’Brien. My colleague Ida Norheim-Hagtun and I were invited to contribute the following piece: Crowdsourcing for Crisis Mapping in Haiti. The edition also includes articles by Mark Summer from Inveneo and my colleague Josh Nesbit from Medic:Mobile. The SAIS Review of International Affairs recently published a special edition on the cyber challenge threats and opportunities in a networked world, which includes an opening article on Internet Freedom by Alec Ross. My colleague Robert Munro and I were invited to submit write the following piece: The Unprecedented Role of SMS in Disaster Response, which focuses specifically on Haiti. Colleagues from Havard University’s Berkman Center also had a piece on Political Change in the Digital Age, which I reviewed here. This blog post is based on the recent presentation I gave at the Emergency Social Data Summit organized by the Red Cross this week. The title of my talk was “Collaborative Crisis Mapping” and the slides are available here. What I want to expand on is the notion of a “marketplace for crowdsourcing” that I introduced at the Summit. The idea stems from my experience in the field of conflict early warning, the Ushahidi-Haiti deployment and my observations of the Ushahidi-DC and Ushahidi-Russia initiatives. The crowd is always there. Paid Search & Rescue (SAR) teams and salaried emergency responders aren’t. Nor can they be on the corners of every street, whether that’s in Port-au-Prince, Haiti, Washington DC or Sukkur, Pakistan. But the real first responders, the disaster affected communities, are always there. Moreover, not all communities are equally affected by a crisis. The challenge is to link those who are most affected with those who are less affected (at least until external help arrives). This is precisely what PIC Net and the Washington Post did when they partnered to deploy this Ushahidi platform in response to the massive snow storm that paralyzed Washington DC earlier this year. They provided a way for affected residents to map their needs and for those less affected to map the resources they could share to help others. You don’t need to be a professional disaster response professional to help your neighbor dig out their car. More recently, friends at Global Voices launched the most ambitious crowdsourcing initiative in Russia in response to the massive forest fires. But they didn’t use this Ushahidi platform to map the fires. Instead, they customized the public map so that those who needed help could find those who wanted to help. In effect, they created an online market place to crowdsource crisis response. You don’t need professional certification in disaster response to drive someone’s grandparents to the next town over. There’s a lot that disaster affected populations can (and already do) to help each other out in times of crisis. What may help is to combine the crowdsourcing of crisis information with what I call crowdfeeding in order to create an efficient market place for crowdsourcing response. By crowdfeeding, I mean taking crowdsourced information and feeding it right back to the crowd. Surely they need that information as much if not more than external, paid responders who won’t get to the scene for hours or days. We talk about top-down and bottom-up approaches. 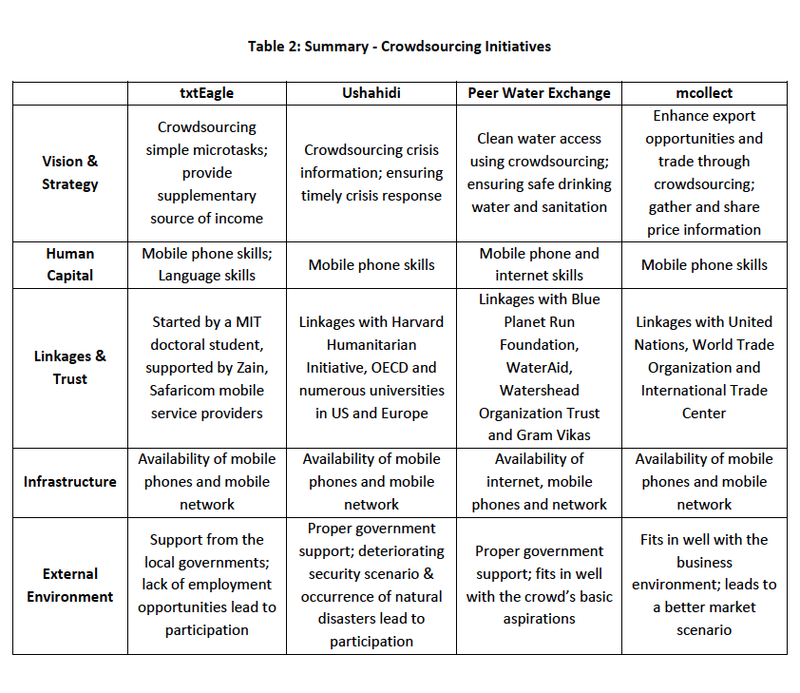 Crowdfeeding is a “bottom-bottom” approach; horizontal, meshed communication for local rapid response. Information of the crowd, by the crowd and for the crowd. For the marketplace to work at the technical level, users should easily be able to map their needs or map the resources they have to help others. They should be able to do this via webform, SMS, Twitter, smart phone apps, phone call, etc. But users shouldn’t have to keep looking back at the map to check whether anyone has posted offers to help in their area, or vice versa. They should get an automated email and/or text message when a potential match is found. The matching should be done by a simple algorithm, a Match.com for crowdsourcing crisis response. (Just like online dating, users should take appropriate precautions when contacting their match). On a practical level, this marketplace will work best if it draws many traders. That’s why the data should be easily shared across platforms. During the Summit, the Red Cross presented findings from this study which revealed that 75% of people now expect an almost-immediate response after posting a call for help on a social media platform during a disaster. The Red Cross and other humanitarian organizations are particularly troubled by this figure. They shouldn’t be. As the Head of FEMA noted at the summit, it is high time that crisis response organizations start viewing the public as part of the team. One way to make them part of the team is to create an open marketplace for crowdsourcing crisis response. Is Ushahidi a Liberation Technology? Professor Larry Diamond, one of my dissertation advisers, recently published a piece on “Liberation Technology” (PDF) in the Journal of Democracy in which he cites Ushahidi and FrontlineSMS amongst other tools. Is Ushahidi really a liberation technology? Larry recently set up the Program on Liberation Technology at Stanford University together with colleagues Joshua Cohen and Terry Winograd to catalyze more rigorous, applied research on the role of technology in repressive environments—both in terms of liberation and repression. This explains why I’ll be joining the group as a Visiting Fellow this year. The program focuses on the core questions I’m exploring in my dissertation research and ties in technologies like Ushahidi which I’m directly working on. Ushahidi is the name of both the organization (Ushahidi Inc) and the platform. This understandably leads to some confusion. So let me elaborate on both. Ushahidi the platform is a piece of software, not a methodology. The Ushahidi platform allows users to map information of interest to them. I like to think of it as democratizing map making in the style of neogeography. How users choose to collect the information they map is where methodology comes in. Users themselves select which methodology they want to use, such as representative sampling, crowdsourcing, etc. In other words, Ushahidi is not exclusively a platform for crowdsourcing. Nor is Ushahidi restricted to mapping crisis information. A wide range of events can be mapped using the platform. Non-events can also be mapped, such as football stadiums, etc. The platform versus methodology distinction is significant. Why? Because new users often don’t realize that they themselves need to think through which methodology they should use to collect information. Furthermore, once they’ve chosen the methodology, they need to set up the appropriate tools to collect information using that methodology, and then collect. For example, if a user wants to collect election data using representative sampling, they will need to ensure that they select a sample of polling stations that are likely to be representative of the overall population in terms of voting behavior. They will then need to decide whether they want to use SMS, email, phone calls, etc., to relay that information. Next, they’ll want to hire trusted monitors and train them on what and how to report. But none of this has anything to do with Ushahidi the platform. Here’s an analogy: Microsoft Word won’t tell me what methodology to use if I want to write a paper on the future of technology. That is up to me, the author, to decide. If I don’t have any training in research methods and design, then I need to get up to speed independently. MS Word won’t provide me with insights on research methods. MS Word is just the platform. Coming back to Ushahidi, if an organization does not have adequate expertise, staff, capacity, time and resources to deploy Ushahidi, that is not the fault of the platform. In many ways, the use of Ushahidi will only be as good as the organization or persons using the tool. 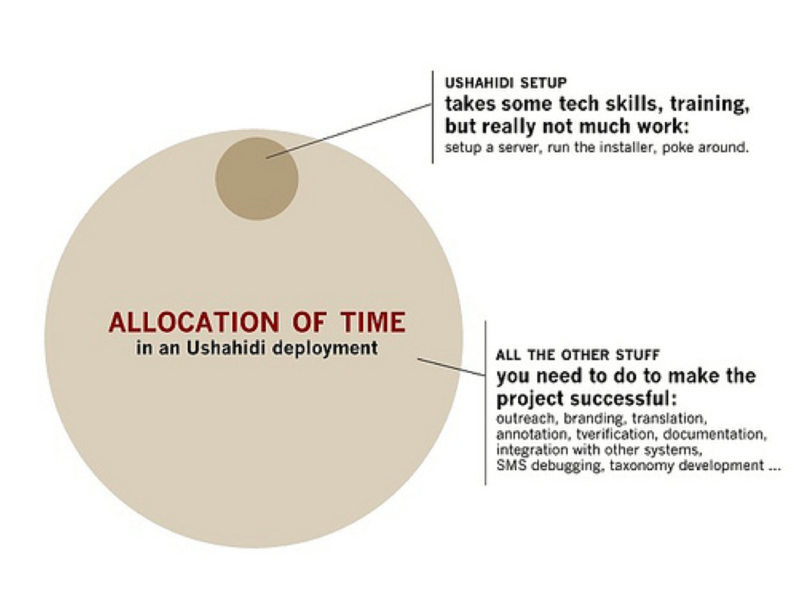 As my colleague Ory aptly cautioned: “Don’t get too jazzed up about Ushahidi. It is only 10% of the solution.” The other 90% is up to the organization using the platform. If they don’t have their act together, the Ushahidi platform won’t change that. If they do and successfully deploy the Ushahidi platform, then at least 90% of the credit goes to them. Ushahidi the organization is a non-profit tech company. The group is not a humanitarian organization. We do not take the lead in deployments. In the case of Haiti, I launched the Ushahidi platform at The Fletcher School (where I am a PhD student) and where graduate students (not Ushahidi employees) created a “live” map of the disaster for several weeks. The Ushahidi tech team provided invaluable technical support around the clock during those weeks. It was thus a partnership led by The Fletcher Team. We do not have a comparative advantage in deploying platforms and our core mission is to continue developing the Ushahidi platform. On occasion, we partner on select projects but do not take the lead on these projects. Why do we partner at all? Because we are required to diversify our business model as part of the grant we received from the Omidyar Network. And I think that’s a good idea. My colleague Ankit Sharma at the London School of Economics (LSE) recently sent me his research paper entitled “Crowdsourcing Critical Success Factor Model” (PDF). It’s definitely worth a read. Ankit is interested in better understanding the “dynamic and innovative discipline of crowdsourcing by developing a critical success factor model for it.” He focuses specifically on mobile crowdsourcing and does a great job unpacking the term. Ankit first reviews four crowdsourcing projects to inform the development of his critical success model: txtEagle, Ushahidi, Peer Water Exchange and mCollect. He then notes the crucial difference between outsourcing and crowdsourcing. The latter’s success is dependent on the scale of crowd participation. This means that incentives need to tailored to recruit the most effective collaborators while “the motive of the crowd needs to be aligned with the long term objective of the crowdsourcing initiative.” To this end, Ankit defines successful crowdsourcing in terms of participation. Ensuring participation requires that the motives of the of the crowd be directly aligned with the long term objectives of the crowdsourcing initiative. “Additionally, to promote participation the users must use and accept the technology of crowdsourcing.” Ankit draws on Heeks and Nicholson (2004), Carmel (2003) and Farrell (2006) to develop the following model. The main question I look forward to discussing with Ankit is this: what level of crowd participation is sufficient for a crowdsourcing initiative to be deemed successful? Should this be a percentage? e.g., the % of a given population participating in the crowdsourcing project. Or should the number be an absolute number? This is not an academic question. Who decides whether a crowdsourcing project is successful and based on what grounds?